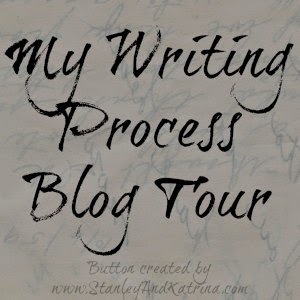 I was honoured last week to be tagged by fellow CWILL member Yolanda Ridge, author of Trouble in the Trees and Road Block (both published by Orca Books), to participate in a series of blog posts about the writing process. Here's how the blog tour works: I will answer four questions about my writing process, below which I will introduce you to three gifted writers of my acquaintance (finding three is harder than you might think!) who will take up this same challenge in the next week or so. Please visit their blogs and see what they have been up to. Once my manuscript was past the line editing stage and sent off to the copy editor, I headed to the library and took out half a dozen books about Prohibition on the West Coast, and wrote up an outline and a first chapter. I'll be meeting with my publisher again in June to discuss my next project, but in the meantime, I have to approve of all the changes the copy editor is making on my current novel. Sometimes I agree, sometimes I don't, and that process takes time that I might otherwise use for writing and researching. In addition, knowing that my novel is coming out in October, I'm putting time into promoting its release--books don't sell themselves! That means creating this blog, organizing the production of a book trailer, and organizing a launch party. Hopefully I'll be done with the copy editing before June, and I can spend the whole summer writing. Well, for one, it features the Baroque painter Caravaggio. Most people's knowledge of artists of the period is limited to two: Michelangelo Buonarroti and Leonardo Da Vinci. And yet, we owe more of our concept of realism to Caravaggio than to any other artist in history. So my work is different simply because very few novels--particularly for children and young adults--have been written which feature Caravaggio as a character . Second, this work is an adventure story. Many historical fiction novels set in this period are much slower in the pace of the plot as they develop the ethos of the period. But because Caravaggio, apart from being a master painter, was a master swordsman--and a murderer--this work is able to bring action and danger to the forefront of every chapter. I'm not sure, but the best I can figure is that I want to know something that just isn't known. In the case of Caravaggio, I was intrigued by his violent and chaotic life; there is very little biographic information about him that is contemporary with his life and trustworthy. Much of what we know about his movements through Italy comes from his commissions, and of his character we rely on a) a few court transcripts in which he testifies, b) the words of one of his bitter rivals, and c) our interpretations of his paintings. For me, this uncertainty opened up the possibility that I could explore through my own fiction a character that the history wasn't able to document. Well, first I need an idea, a seed crystal which can draw from the supersaturated solution of my research and grow into something solid...and spikey...and--okay, this metaphor isn't working. But once I have that essential idea, I build an outline of a plot around it. Then I discuss it with the most knowledgeable people I can find to try to poke holes in the plot, find the soft spots, until I've got something that I think will work as a consistent, unified story. By that point, I've got a better sense of the theme, and the theme becomes the guide to my writing from page one. I need to have a sense of the particular understanding of life and the world that I am trying to communicate, so that my plot and dialogue is consistent with that idea. After that, it is several years of late nights and early mornings at my computer. As a working teacher with children, I don't have hours to spend at my writing each day. It's a few minutes here, a half-hour there, wherever I can squeeze two moments together. Caravaggio: Signed in Blood will have taken me six years from conception to published book. As promised, allow me to introduce you to three dynamic authors with a wide variety of writing experiences. David Russell is the author of Deadly Lessons, nominated by the Crime Writers of Canada for its Arthur Ellis Awards, and Last Dance, the sequel to Deadly Lessons. David is a long-time member of the arts community in Vancouver. He has worked on stage and television, including performing as a company member with the Vancouver TheatreSports League for more than 15 years. Russell has written freelance for a number of publications, including Maclean's, Vancouver's Sun and Province, the award-winning online news site The Tyee, and others. He lives in Coquitlam, British Columbia. Ace Baker has won the Zola Award by placing first in poetry in PNWA's 2012 writing contest. He has also won the Storyteller Award for Short Fiction and the SIWC Poetry Prize, and his award-winning story, Victory Girl, will appear in the Fall 2014 issue of Pulp Literature. PJ Reece is the author of two novels, Roxy and Smoke that Thunders, has ghostwritten a memoir of escape from Iran, and most recently self-published Story Structure to Die for. Early in his career, Reece pioneered the film industry in Alberta, and after trading camera for keyboard in the late 1980s, he wrote, story edited, and directed scores of programs for American and Canadian television networks. Please visit their blogs in the next week or so to learn more about them and their writing process. I just received the cover image via the publisher yesterday. Writers don't typically have any input into the cover art, and now that I see this I am so glad. I love the ghosted imaging of the sundry characters in the story, and Beppo's wary glance back over his shoulder gives an excellent sense of his conflict. And puh-lease! Is the font for "Caravaggio" amazing or what! The artwork was done by multiple-Governor General's award winning illustrator Stéphane Jorisch, from Montreal. 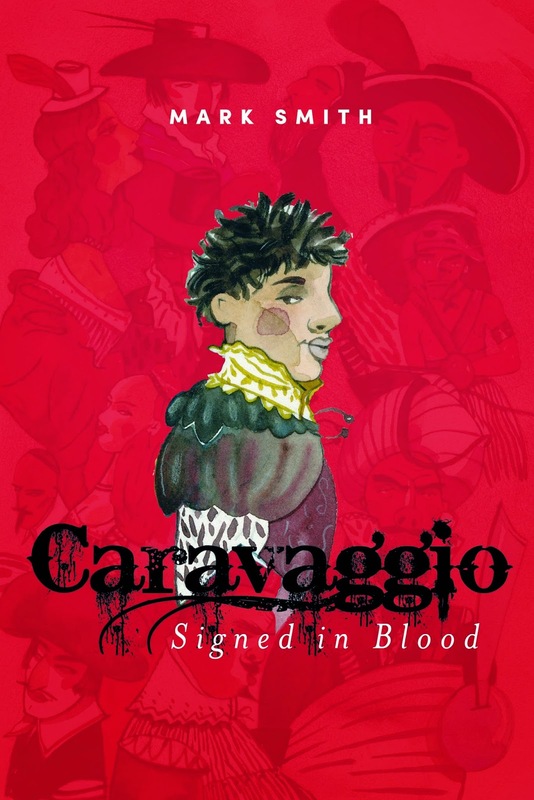 Caravaggio: Signed in Blood is historical fiction for 12- to 14-year-olds published by Tradewind Books. It follows the adventures of Beppo Ghirlandi, an indentured servant falsely accused of murdering his swindling master, as he flees early 17th Century Rome in the company of the painter known as Caravaggio, himself a wanted man. Their flight takes them through the Italian countryside and south to Naples and Malta, battling bounty hunters, pirates, and Caravaggio's own personal demons in their quest for a pardon. If that weren't enough, the penniless Beppo has fallen in love with the beautiful daughter of a famous--and socially ambitious--courtesan. How can he clear his own name? How can he stop Dolcetta from marrying the man her mother has chosen for her? And how can he protect his new master from vengeful foes, when Caravaggio's greatest enemy seems to be his own troubled mind? You can find out this October. Stay tuned.